The Best 50 Years: Every Girl Should Own a Dress! About 30 yards of cotton prints destined for Dress a Girl. 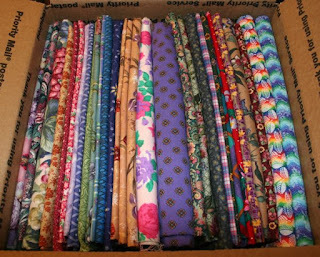 In my quest to simplify and declutter, I just sent this box of floral fabrics to the Northern California Dress a Girl Around the World ambassador for use by her group at their regular sewing events. I found out about Dress a Girl from my mom in OR, who found out from my aunt in CO, who is sewing dresses now that she's newly retired. Sewing dresses isn't something I can devote time to right now but I figured I could still help the cause. When choosing which fabrics to send, I held my hand and arm between the layers in front of a window and rejected any that were too see through. Although I wanted to send some beautiful pastels, I found they were just too sheer. I tried not to go too dark beings most of the girls likely live in hot, sunny places but did try to choose fabrics that wouldn't show dirt between washings. By the time I finished, I'd rounded up about 30 yards total, which weighed close to 12 pounds. 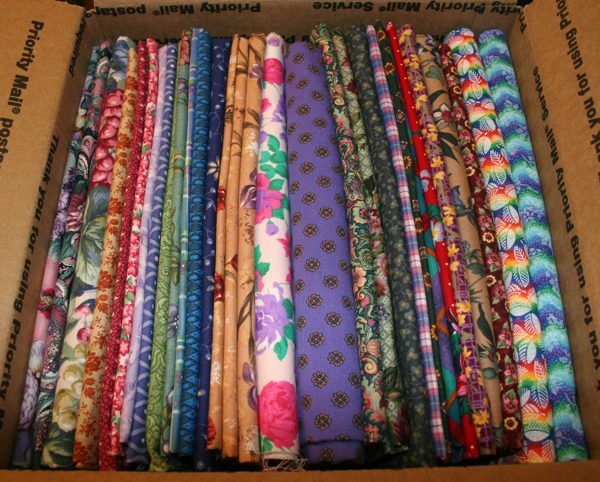 I'm just so happy to release all this beautiful fabric to a new home and a good cause! According to the website, "Dress a Girl Around the World is a Campaign under Hope 4 Women International (a 501 (c) 3 organization) bringing dignity to women around the world since 2006. Hope 4 Women International is a nondenominational independent Christian organization." If you'd like to get involved, just check the website for a local group - or start your own! Yes, every girl should own at least one dress.